Pizza Flavored Shapes. Whittaker’s Chocolate Coconut Block. Holiday Ham & Turkey Pimento Cheese. TRISCUITS! One cold and wintery evening while living in Australia I drew a nice hot bath, plugged in my computer at the edge of the tub (yes, yes I know this is the start to like 5 different bad movies and that if the computer had fallen into the tub I would have been electrocuted only to change bodies with my Mom or start hearing men’s thoughts or something) and climbed in. Then I reached down and opened a box of Shapes (http://www.simplyoz.com/products/on_sale_-_limited_quantities/arnotts_shapes) and proceeded to eat the entire thing while watching Project Runway. Was this kind of disgusting? Yes, yes it was. It was also totally awesome. There are similar stories of mine about Whittaker’s Coconut Chocolate while living in New Zealand and certainly regarding HH&T’s Pimento Cheese with Triscuits when I’m back in the U.S.A (similar as in over-indulging not as in eating in the bathtub…that was really a one-off, over-eating while naked is kind of disturbing and really eating naked at all seems gross to me, maybe I am repressed, I don’t know…okay, digressing). Point being, while I am not much of a junk food eater, when I find my junk food that I love I can go a little overboard. Lucky for me, however, the aforementioned junk-food kryptonite doesn’t exist in every country and I have to travel long and expensive distances to get it. However, this does leave a hole in my diet, an inner aching as my cellulite calls out to me in agony, “please, we need you to eat more garbage, we’re shrinking!” Wouldn’t want that to happen, now would we? So, it is only natural that I have found a new junk food addiction here in France. Now, we have already covered the issue that while France is exceptionally good with food it doesn’t mean that they don’t have their own junk food as well (Exhibit A: https://breadispain.wordpress.com/2011/06/15/perfection-and-the-art-of-junk-food/). And while I find things like apericubes and fully frozen hamburgers repugnant I do have my not-so-secret shame. A shame deeper than apericubes and a little bit gross…crabssdlkjgkdlsjaktlja. 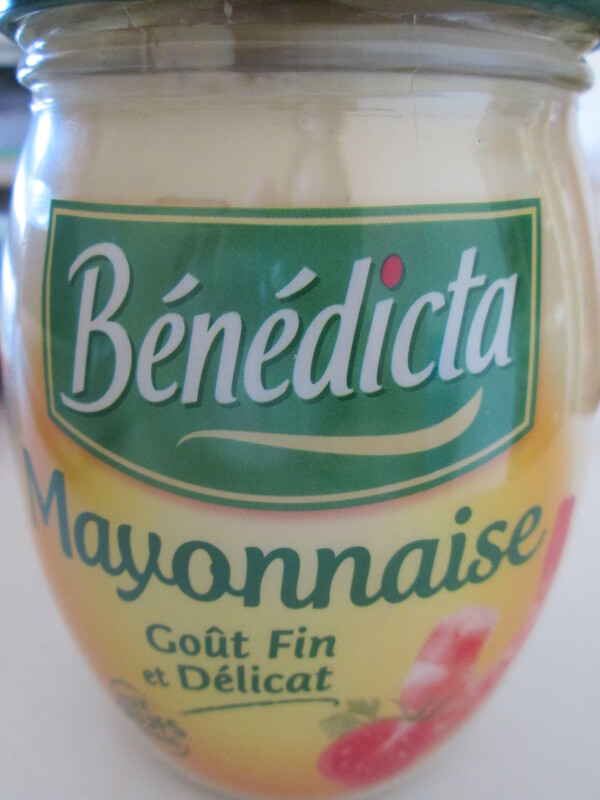 The EVIL Benedicta that promotes my crabstick addiction. grew. Now, I have to physically stop myself from being lured into the crabstick section at the grocery store (yes, that exists) as the chemically goodness calls to me, “But we are so tasty, we are SUCH a good vehicle for getting mayonnaise into your mouth!” BWAH! Quit taunting me with your siren song, Crabsticks, we all know that I will feel sick after I eat you! But this is one of the unspoken perils of being an expat or in an international relationship, while on the one hand you gain a first-hand understanding of a new culture; on the other hand you gain a first-hand understanding of a new culture. Meaning, when you are living somewhere overseas or with a someone from another country you can’t cherry-pick all the delightful things about the new culture…you get it all – the tournedos rossini and Quick’s, France’s major fast food chain, foie gras burger (check it out: http://www.fastandfood.fr/2012/11/28/le-burger-au-foie-gras-de-quick-revient-en-decembre/). It’s the darker side of the expat life…and for now, I’ll just let you digest that. Here’s something you’ll love: Take a ripe avocado, cut in in half (and save skins). Dice up crab sticks and avocado and mix with mayo. Place everything in avocado halves and spritz with lemon juice. Add salt and pepper (and cumin!) to taste. I got this idea from a cuban restaurant. If you can find large plantains, you can put a dollop of this mixture over a large tostone. Or, serve tostones or plaintain chips (chifles) on the side. (They sell plantains and chifles at World Market (blvd Gambetta) and at Viet Hung (Nicolas Chorier). I have a box left of Mac n’ Cheese in our cupboard that has been there for over a year now.. It’s like I’m waiting for a holy moment to eat it! 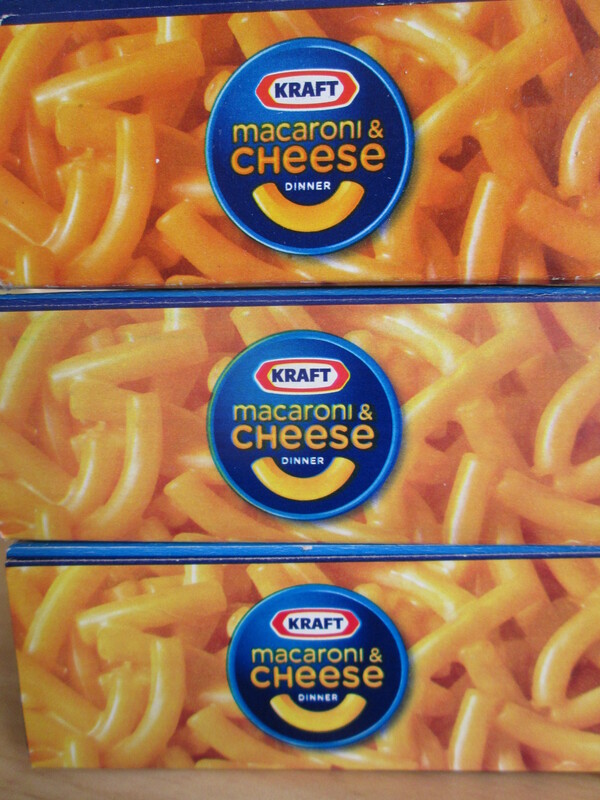 Note to self: try making homemade Mac n’ Cheese and invite Nancy-Kate and Xav over to try it! Have you ever tried making it at home? P.S. I hope you no longer bring your computer close to your bathtub! Scary! YUM! That sounds right up my alley – I love me some avos as well! I would eat a whole box right now if I could – ANY flavor. Funny as always! I have yet to find a French junk food that really tickles my fancy… but when my parents send me care packages there is almost always a bag of flamin’ hot cheetos… and it gets eaten within the day most of the time! Oh my, this made me laugh SO hard. And you know very well that when I break down and buy the Cheddar Goldfish crackers at Monoprix (try and tell me that you can’t find them at a big Monop’ in the center of town! PLUS Heinz Blue Cheese AND caesar dressing! ), yes, I can easily eat the whole bag in one go. Have a good weekend! Good karma to you for making me laugh so hard!!! HA – I love that I am not the only crabstick/benedicta addict! We are not alone!! haha! OH my goodness – I did buy the goldfish after you told me they existed at Monoprix but never again because I consumed them like it was the last bag on earth. As for the dressing I think I’ll stay safe as long as they don’t bring Ranch over…then I’m screwed! (ranch dressing on pizza…did I just say that outloud?) Bon weekend!! DUDE – I’m so jealous! I love Ranch so very much…le sigh! Um…I totally would, haha! However, our Casino doesn’t have it – they do have French’s Mustard and Skippy Peanut Butter though so I am pretty happy. It’s so funny the things that you end up missing! Can I send you a shipment of Shapes and Whittakers? FB message or email me your address and I totally will. oh sweet jesus that would be amazing – I would tear up some shapes!! p.s. we are hoping to have a trip to OZ/NZ organized for New Years Eve/January!! arnotts barbecue shapes dipped in japanese mayo with a little blue cheese with crab sticks. Now that is two star michelin. awww man, shapes, shapes can do no wrong and YES the japanese mayo – YUM!